Activity has calmed down since 11 am on 28 Dec and not produced any new explosions during the second half of the day, but resumed yesterday with some weak ash emissions. Ineter reports continuing degassing but at lower intensity and also lower seismic activity. It is not clear yet if this marks already the end of the current episode or only a temporary break. The Minister of Health announced that two hospitals in Chinandega reserved a portion (40% and 30%) of their room capacity empty in order to accommodate and treat possible victims affected by the eruption. A few dozen cases of respiratory problems have already become known from the community of Las Grecias. He recommended to people to protect themselves with hats and masks and drink plenty of fluids. More ash emissions and explosions have followed and are at times near continuous. The height of the ash columns is reported to be about 500-800 m above the crater. VAAC Washington was able to observe the ash plumes on satellite and issued warnings about ash plumes at 14,000 (4.2 km) altitude. Light (few mm) ash fall has occurred in up to 6 km distance from the volcano including in several inhabited areas located mainly NW, W, SW and S of the volcano, namely in El Viejo, Grecia No. 1 and 4, Las Rojas, Banderas, and Abraham Rugama. The reported activity correlates to a marked increase in seismicity and the appearance of a strong continuous tremor signal. Banded volcanic tremor has reappeared on the seismic recording. 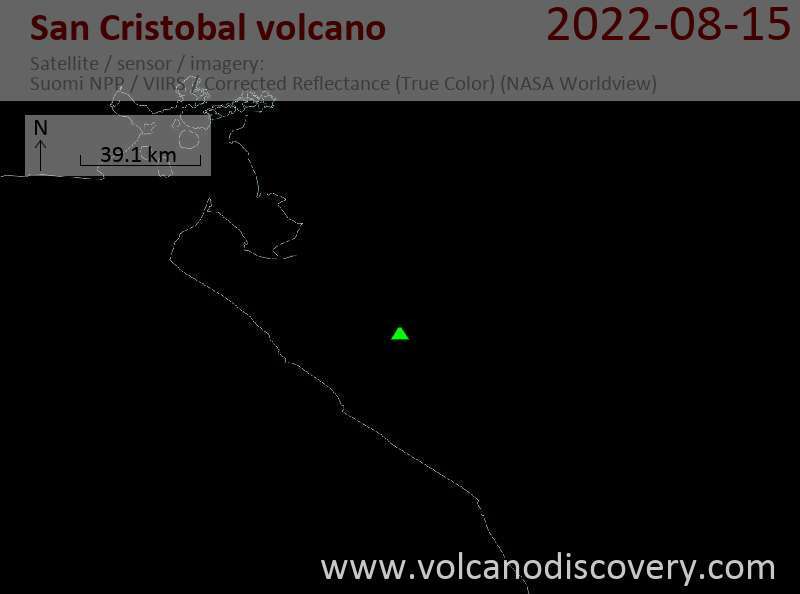 Some tremor has been appearing periodically on the seismic recordings from San Cristobal in recent days. Seismic activity at the volcano seems to be decreasing, although a few earthquakes still occur. INETER has not published any reports since 16 Sep, suggesting that not much activity is happening. A number of volcanic quakes and long-period events can be seen on the seismic recordings during the past days, but there have not been any reports of new activity. The volcano has been calm the past days. On the seismogram, few weak quakes and long period events are visible. Elevated SO2 emission continues to be measured. On 15 Sep, SO2 flux was measured at 3,054 tonnes per day. INETER suggests in its latest press release yesterday evening that this increase might have been caused by a liberation of the conduits. Early yesterday, between 6:50 - 827 am local time, there was a pulse of tremor and 2 week earthquakes at 7:47 a.m. and 7:51 a.m. which could not be felt (see image from yesterday's update). Today, the seismicity has been rather low again. Field work made by technicians and INETER staff reported that the 8 Sep explosions did not open fractures on the volcano's south flank (but occurred from the central vent in the crater / comment) and found ballistic impacts in up to 850 m distance from the crater. It was noted that 3 out of 5 fumaroles located on the south wall inside the crater were blocked. Fumarole 1 and 2 vents were measured at a temperature of 85 ° Celsius, equal to the previous months. A new moderate explosion occurred on the evening of 11 Sep shortly before 20h00, INETER reports. Seismic activity remains elevated. 3 small explosions occurred yesterday afternoon (at 3:33, 3:35 and 3:36 p.m.) and produced small steam and ash clouds rising 300 m above the crater. If rain occurs, the rain mixed with with ash and gases will cause acid rain and can also produce mudflows in gullies draining the volcano. At the time of writing this bulletin, there have been 26.1mm rain accumulated (4.00 PM).